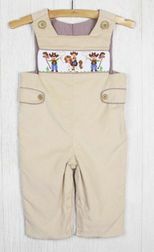 Here is Zuccini's tan/light brown corduroy longall with side tabs that is REVERSIBLE to brown gingham! 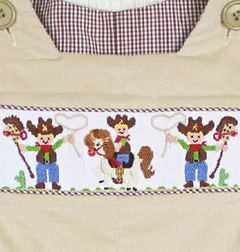 The front of the corduroy side is smocked and has hand embroidered adorable little cowboys with their stick horses and lassos. 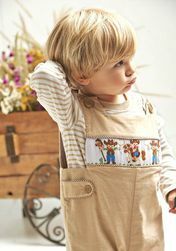 The smocking panel and the tabs are trimmed in brown gingham.